A paper published today in Global and Planetary Change reconstructs sea surface temperatures [SSTs] in the South China Sea over the past 12,000 years and finds another non-hockey-stick with SSTs demonstrating a long-term cooling over the past 6,000 years since the Holocene Climate Optimum. In addition and contrary to claims of climate alarmists, the authors show the frequency of modern El Ninos is near the lowest levels of the past 10,000 years. Sea surface temperatures in 2nd graph from top show a long-term decline. Horizontal axis is thousands of years before the present. 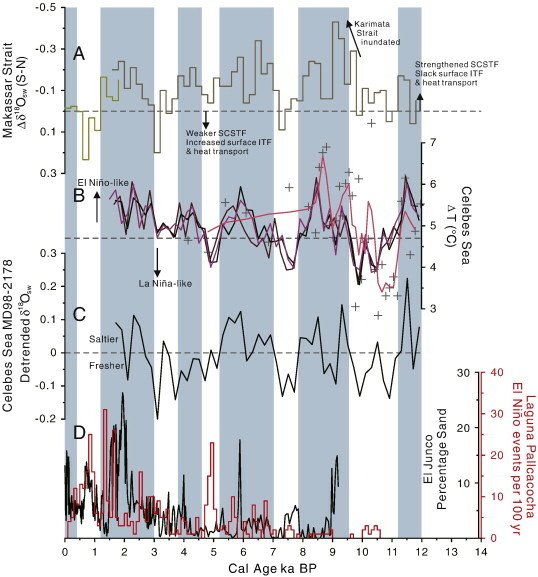 Multi-decadally resolved changes of the ITF/SCSTF system over the Holocene. 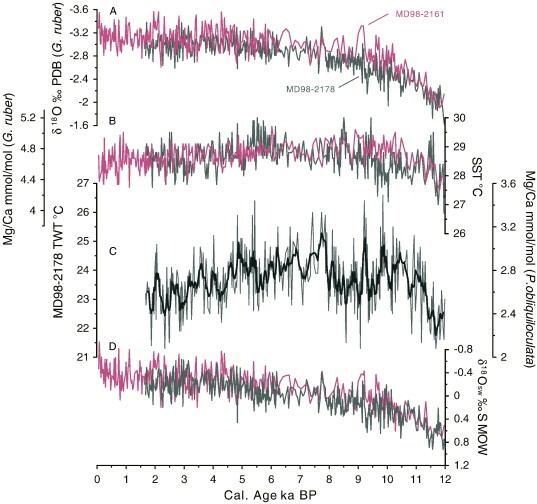 Variations of the Celebes Sea thermocline probably reflect ENSO–like variability. ENSO-like variations likely play an important role on the ITF/SCSTF transport. The Indonesian throughflow (ITF), as one of the key links of the global thermohaline circulation in the tropics, influences the large-scale redistribution of ocean heat and freshwater between the Pacific and the Indian Ocean. The ITF interacts with the low-salinity South China Sea throughflow (SCSTF) in the Makassar Strait at the pace of El Niño Southern Oscillation (ENSO). In this paper, variation of the throughflows via the Makassar Strait over the past 12 ka is reconstructed according to the seawater δ18Osw differences (indicating salinity gradients), which were determined based on paired measurements of δ18O and magnesium/calcium ratio (Mg/Ca) of Globigerinoides ruber obtained from two sediment cores from the northern and the southern ends of the Makassar Strait respectively. Furthermore, thermal structure variation of the upper water column in the upstream ITF is retrieved on the basis of the temperature difference between the sea surface (G. ruber) and the thermocline (Mg/Ca of Pulleniatina obliquiloculata). It is shown that the surface ITF might have become stronger during the intervals 0.6 ~ 1.2, 3 ~ 3.6 and 7.2 ~ 8 ka BP. It also turns out that the SCSTF/ITF system and the upper ocean thermal structure co-vary with each other, and are likely linked with ENSO-like variation of the tropical Pacific. During El Niño-like periods, such as 1.2 ~ 3, 3.8 ~ 4.6, 5.2 ~ 7, and 8 ~ 9.6 ka BP, the depth of thermocline in the Celebes Sea shoaled and the transport of SCSTF was enhanced, meanwhile the surface warm water transport of the ITF was reduced. An opposite evolution was reconstructed during La Niña-like periods.